We have compiled an overview of attractions and places to visit that will give you a wide experience of all that the West Country has to offer. Whether you are looking for an active holiday with surfing, horse-riding, cycling and watersports or just relaxing on the many beaches, leisurely walks and enjoying the wonderful countryside, there is something for everyone to enjoy. We have only listed those that are reachable within an hour or so, though of course there are some wonderful places to discover further afield such as Land's End (2 hours) and St. Michael's Mount. We have included the weblinks so you can discover more information about any attractions listed. The cottages will have an informative selection of tourism leaflets to peruse when you are here and we will be only too pleased to offer help and advice to make your stay with us as enjoyable as possible. 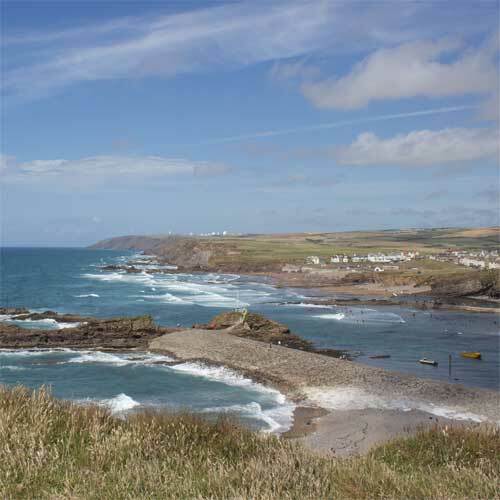 Our nearest and most frequented place to visit is the spectacular coastline of North Cornwall. With many beaches along the coast including Crooklets and Summerleaze at Bude, Widemouth Bay, Northcott Mouth, Sandymouth and Duckpool, there is something for everyone. All have stunning scenery and access to fantastic clifftop walks as part of the South West Coastal Path. A great tourist coastal town with an abundance of activities for all ages. 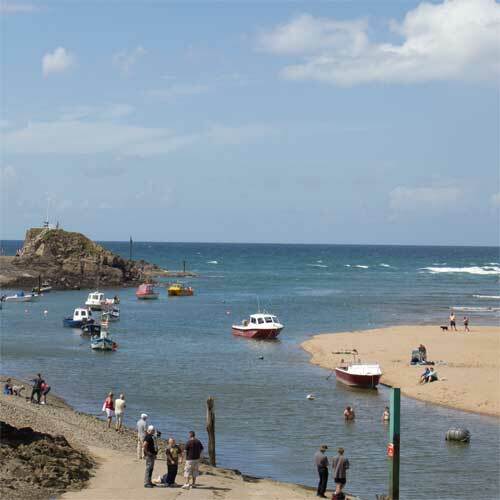 With two beaches in the town, seawater swimming pool, the Canal and Breakwater, Bude has much to offer. You can learn to surf and enjoy many activities at Adventure International (www.adventure.uk.com). There is also crazy golf, tennis courts, childrens play areas and just outside the town you will find the Splash Pool with wave machine and slide and Harlequinns with an indoor childrens soft play area, ten-pin bowling and Go Karting. With 300 miles of beautiful coastline you will find the perfect beach whether you wish to surf, swim, sail, relax or go for a clifftop walk with stunning views. Choose from Westward Ho, Croyde, Woolacombe and Ilfracombe to name a few. In the north-west corner of Devon you will find Hartland. It is a haven of peace and tranquillity with 12 miles of coastal scenery, Hartland Point & Quay, Hartland Abbey and Docton Mill Gardens. Visit www.hartlandpeninsula.com for more information. On the edge of Dartmoor, has over 730 acres of water. It"s a place where you can walk, cycle, fish, sail and has a Visitor Centre, cafe and childrens play area. Tamar Lakes offer something for everyone, with it’s Upper & Lower lakes. You can hire water craft, walk or fish, There’s a tea-room, play area for children, Visitor Centre, cafe and nature reserve. Visit www.swlakestrust.org.uk for details on all South West lakes. Cycling is a great way to see Devon at its best with nearly 150 miles of National Cycle Network in Devon. 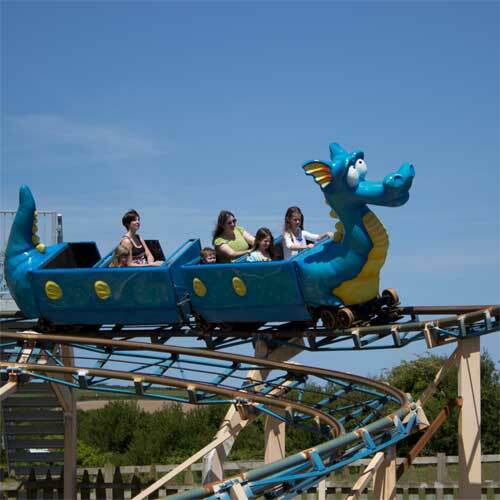 Tapeley Park at Instow, near Bideford, has four distinctly different themed areas set in a 60 acre site. Enjoy a leisurely walk around the woodland paths, a labyrinth made from large chunks of granite, animals and childrens play area. There are many National Trust places to visit in Devon & Cornwall reachable within the hour. These Include Arlington Court, Lanhydrock, Cotehele, Buckland Abbey, Lydford Gorge, Finch Foundry and Castle Drogo. See www.nationaltrust.org.uk for further information. The castles of Tintagel, Okehampton and Launceston are all owned by The English Heritage and make for a great visit. Tintagel Castle is the legendary birthplace of King Arthur and has a spectacular location on Cornwall"s dramatic Atlantic coastline. Climb the rugged trail to reach the island and explore the ruins of this ancient castle. Okehampton Castle stands in a stunning setting amid the foothills of Dartmoor. With free audio tour, woodland walks and riverside picnic area, explore the former home of one of Devon&s most powerful families. We are happy to accept dogs at Staddon Barns. We know how difficult it can be to find suitable carers whilst you are away, and also know that many of you wish to bring your dog on holiday, afterall they are part of the family and deserve a break too!! There is plenty of outside field space for dogs to roam, there is an off-road bicycle/walking track nearby. Holsworthy Woods are less than 5 minutes drive, Roadford Lake within 20 minutes and of course there are glorious coastal walks along the South West coastal path.